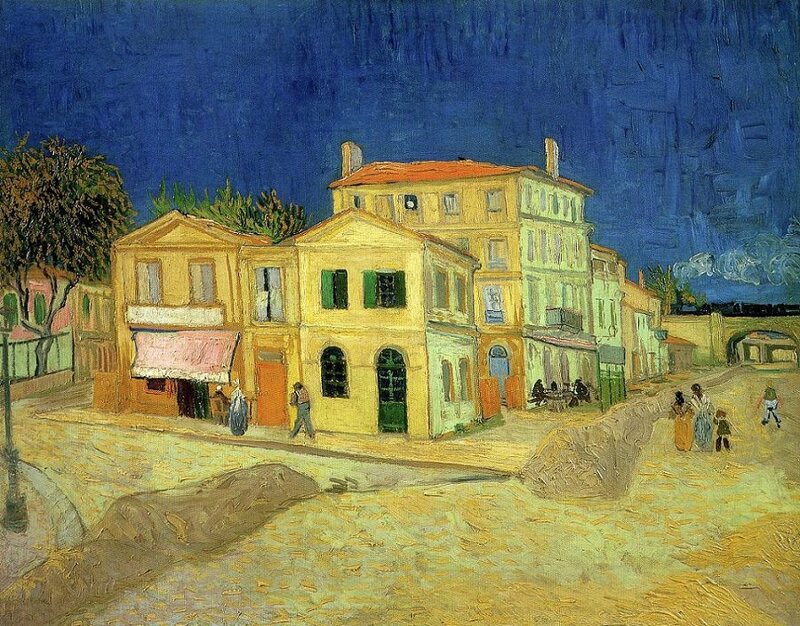 Van Gogh lived and worked in the Yellow House, at first staying-there with no furniture until he could scrape together enough money to buy some. His brother Theo, who sent him a small amount of money each month in return for his paintings (though he had little success in selling them), was still supporting him. Van Gogh's continued close relationship with his brother also kept him in touch with the art scene in Paris and with his fellow artists. He quickly became lonely in Aries, and before moving into the Yellow House was hoping to persuade Gauguin or Bernard to join him and set up the studio together. He had met several local amateur artists in Aries, and in June 1888 met the artists Dodge McKnight (1860-1950) and Eugene Boch (1855-1941), with whom he was particularly taken, while they were spending some weeks in the area. Increasingly, the colour that Van Gogh used came to be associated with symbolic meaning, so that here for example the fresh yellow house against a clear and deep blue sky expressed the artist's contentment at that particular moment.